Shannon Beador is taking to her Bravo Blog to dish on this week's episode of The Real Housewives of Orange County. Shannon Beador talks about drag bingo and reacts to Vicki Gunvalson's allegations. "I was in Hawaii last week on a family vacation, so I have just a few comments about last week’s episode. Peggy is clearly going through a lot with her surgeries. Her story doesn't make a lot of sense to me, but I am not going to get involved. I hope she doesn't have cancer. I am not a Spartan, never will be, and that's okay. Working out at Dr. Tim's is good enough for me. 30 minutes every day and I'm done. David does the 10 mile Spartan Race and he has made it clear he would never want me to enter a race because he doesn't want me to get hurt. It's an incredibly exhausting and rigorous event. That being said, when David suggested a romantic weekend away that was also a Spartan Race, I respectfully declined. We haven't been away alone together for a while and If we do, I want to know that it's because he wants to spend the time with me, not to kill two birds with one stone. Talking about David's daily exercise regime is not emasculating. I was simply stating the facts. I really wish that Lydia would stop forming opinions about me when she still doesn't know me. She met David for the first time at the Spartan Race. Yet she somehow thinks it's okay to insinuate that I don't support my husband? Tamra knew that I couldn't go to the race because the twins had a championship basketball game. When you are parents of three very active children, you oftentimes have to divide and conquer. David and Eddie typically go to all of the Spartan Races together and we stay home, but for this race I am an unsupportive wife...keep your comments to yourself for once, Lydia. St. Patrick’s Day was crazy fun and so unexpected! I never thought that Kelly and I would get to such a place and it’s very nice. I think it was the first time that we were together alone without outside influences which was clearly important to do. We really opened up and had a ball! And now onto the fun episode! I never recorded Kelly at a crowded and loud bar. I have no idea how to do that and never would. I don’t even have music on my phone because I don’t know how to put it on! It is so unfortunate that literally less than 24 hours after making amends, that Kelly thought I would do something negative. I’m not sure why, but it seems like Kelly thinks a lot of people are out to get her and that makes me sad that anyone would feel that way. I usually don’t comment on parts of the show that I am not in. But I do have to say that I have never heard more about money spent than when I hear Peggy rattle off price tags. I was always taught to be humble and not brag about what you have. To each his own. I am so tired of Vicki saying that she is a victim. Meghan hit the nail on the head that Vicki was looking for sympathy two years ago. Vicki needs to stop saying that she said things to Kelly “privately”. She knew they would make it into the universe at some point. Vicki has no proof of her false allegations and I am tired of the threats. I am thankful that Meghan is sticking up for me. Vicki has a well known history as a liar and I believe that she absolutely has “hurt” as her end goal. I have finally reached a point where Vicki’s ridiculous allegations are not going to affect me anymore. It was just reaffirmed after the phone call from Meghan. I’m not going to get emotional about her lies anymore. I can honestly say that nights like Drag Queen Bingo are what make life so much fun! When dressing up, the crazier the better! And I love that Tamra embraced the craziness with me! She was absolutely hilarious! The blacked out tooth! No words! 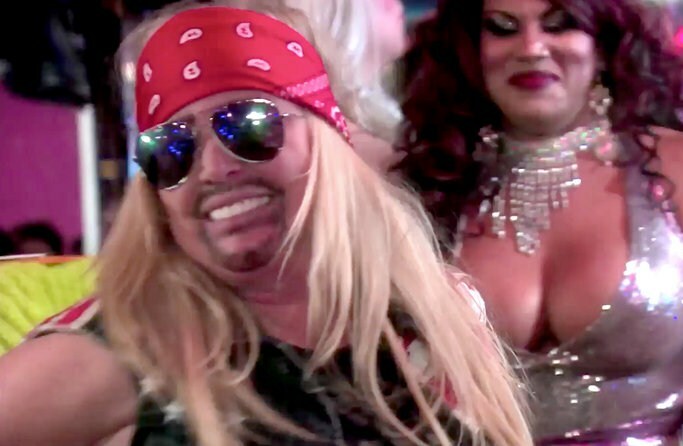 But can I just gush about Bret Michaels for just one minute? Rock icon! Call me Unskinny Bop Beador. Do you want to talk dirty to me? Love you Bret! Meghan looked amazing! The fact that she was pumping while she dressed up as a man was classic! Drag Queen Bingo at Hamburger Mary’s in West Hollywood benefited the charity A Safe Place for Youth. I have never been to any drag queen show, but if I’m going to do it, I’m going all in. And the night was benefitting an amazing cause for at risk youth. While I appreciate that Lydia may have felt a bit uncomfortable, I think she needs to loosen up a bit. She constantly criticizes me every week, so I am going to go out on a limb and say “have some fun Lydia”. And then Lydia gave me a Bingo card that she knew was false so I got spanked. Not sure what her agenda was, but I don’t think she would have enjoyed being spanked. I, however, embraced the moment and have a memory to laugh about for years to come! It was upsetting to hear Kelly and Meghan argue. First of all, any allegations that have to do with infidelity are horrible. Infidelity is like a knife in the heart and it is reckless to make allegations that are so hurtful. Every mother is the best mother that they can be. It is not right for any mother to criticize another mother. I have to hope that Kelly didn’t mean to say it. We all do the best that we can. It starts to heat up next week like no tomorrow. I have no words for the previews and I haven’t even seen the episode yet!"